Srinagar: Surgeons at the Government District Hospital, Anantnag are reported to have removed a 14.4 kg ovarian cyst from the body of a 19 year old girl who was brought to the emergency of the hospital. The cyst, with the shape of a huge football was overlaping with the other organs inside the uterus. Ironically, the patient and the family had no inkling about the huge mass inside her abdomen reports DNA. The patient had been suffering congenital heart disease and visual impairment, and battling with symptoms of above including breathlessness, would mostly ignoring her general stomach pains. On complaint of regular stomach ache, she went to a private doctor who diagnosed the cyst and adviced operation. However, due to un-affordability, the patient and the family did not follow up, till one day she had to be rushed to the government hospital with complaints on intense abdominal pain. “The patient was admitted with abdominal distention and pain. Ultrasonography showed a huge cyst. A Contrast Enhanced Computerized Tomography (CECT) scan was conducted which revealed that the huge ovarian cyst was occupying the whole abdomen, pelvis, pushing diaphragm, and heart superiority,” Dr Azad Malik, Consultant Surgeon, Government District Hospital, Anantnag, who conducted the surgery, told DNA. During the 45-minute procedure, a football sized cyst was removed from her abdominal uterine cavity on January 19. 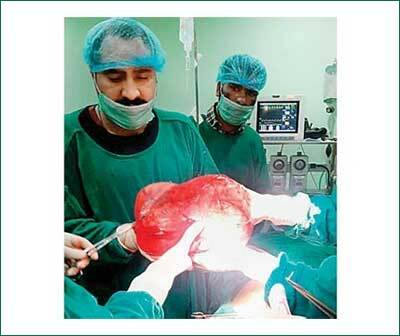 “The cyst we removed weighed 14.4 kilogram. The patient was transfused two units of blood. She is better now and we resumed orals on Saturday,” said Dr Malik. Owing to her existing condition of CHD , the patient was operated along with the involvement of a Cardiologist. “Due to her heart condition, she developed breathlessness. A cardiologist intervention was also provided. Later, she was shifted to Sher-e-Kashmir Institute of Medical Sciences for cardiology consultation. Doctors have reported that she is fine know and will be discharged in a couple of days”, said Dr Malik.